Knightguard Security roller grilles are an ideal solution where strong security is required that provides a physical barrier while allowing unrestricted airflow, light transmission and high visibility through the roller grille. Knightguard Security roller grilles are suitable for a wide variety of applications in commercial shop fronts, hospitality industry, retail industry and even homes & residential dwellings. They're ideal for maximising limited space - by rolling up and out of the way they provide an unobstructed passage way when open. The Knightguard Security roller grille is high in performance. The interconnecting aluminium links which make up the Knightguard Security roller grille curtain offer high strength, toughness and great looks. The compact roll size means Knightguard Security roller grille will take up less space and be suitable for smaller openings or restricted head room than comparable roller grille products. Knightguard Security roller grille roller shutters are easy to use and operate with both manual and a variety of electric control options available. Advanced Shutter Industries has been a manufacturer of roller shutters and roller grilles since 1976 and continues to offer some of the best products available in Australia today. Knightguard commercial roller shutters and roller grilles are manufactured in our Belmore factory in Sydney NSW Australia for supply & installation and are available to be supplied to city & country areas in Brisbane QLD, Melbourne VIC, Hobart TAS, Adelaide SA, Perth WA, Darwin NT, Canberra ACT, and are also available for export outside of Australia. Book your FREE quote today. Ring us on (02) 9718 9988 today! Knightguard Security roller grilles increase the security of your business and are a visible deterrent to would-be intruders. Knightguard Security roller grilles provide protection while allowing unrestricted ventilation through the roller grille even when closed. Knightguard Security roller grilles provide protection with full visibility through the roller shutter even when closed. Knightguard Security roller grilles are simple to use and operate with a variety of manual and electric motor controlled lifting mechanisms available, giving you full control over your environment. Operation, opening and closing, locking and unlocking is customised to your needs so you choose how and where you want to open and close your Knightguard Security roller grille, whether it is from the inside, outside, both inside and outside, via keylock, hasp and staple, electric key lock or radio remote control. Manual Override mechanisms as a safeguard to allow manual opening and closing of your roller shutters in case of a power outage. Electric tubular motors for roller shutters are suitable for all roller shutter sizes all the way up to 250kg in weight. Roller shutters fitted with an assist spring as the lifting mechanism allow the roller shutter curtain to be physically raised and lowered by hand. The assist spring balances the weight of the roller shutter curtain and makes lifting and lowering the roller shutter easier and safer. Spring assist lifting mechanisms are suitable for roller shutters starting from 1.0 m wide. For commercial roller shutters wider than 2.7 m fitting a second assist spring is highly recommended to avoid axle torsion and ensure even lifting. In any case, we recommend use of an electric motor for roller shutters weighing more than 60 kg or wider than 3.0 m.
The spacers between each metal link on the Knightguard Security roller grille curtain are available in grey colour only. Inwards or outwards facing roller shutter roll. All visible aluminium components on Knightguard Security Roller Grilles are available in clear anodised matt finish. Optional powder coating of aluminium components to specified colour and anti graffiti coating are available as extras if required. a series of pvc spacers. The aluminium links are used to connect to aluminium tubes. The resulting curtain of the Knightguard Security Roller Grille forms a brick pattern with recurring openings of 200 mm wide x 45 mm high. The interconnecting aluminium links which make up the Knightguard Security roller grille curtain offer very high strength and toughness. Add 1.5 kg / m for each mid rail or bottom rail. For width beyond roller shutter maximum specifications use multiple roller shutters within maximum width with fixed or removable mullions if appropriate. 54 mm x 32 mm clear anodised guides available for use without pelmet box. 85 mm x 17 mm clear anodised Bottom Rail included as standard. Optional aluminium foot (64 mm deep) fitted under the bottom rail suitable for resting on counter tops is available if required. 85 mm x 17 mm clear anodised Mid Rail is available as an optional extra to provide added strength or to house waist-height keylock. 70 mm diameter octagonal galvanized steel axle fitted with 130 mm diameter adaptor rings. Note: Dimensions are a guide only. Incorporation of a midrail increases the roll diameter. 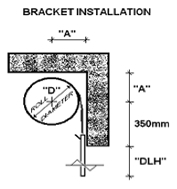 "A": Axle displacement suggested for distance of axle from wall or ceiling. "DLH": Daylight height of opeining. 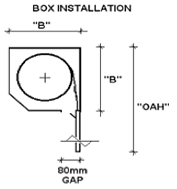 "B": Pelmet box height and depth. "OAH": Overall height of roller shutter from top of pelmet box to bottom of curtain travel (e.g. to ground or counter). Electric 240V motor with built-in radio remote receiver and paired radio remote control. Free-wheeling safety clutch that avoids damage to the roller shutter if an obstruction is encountered under the roller shutter while being lowered. Installation and delivery. Both can be arranged if required. Due to continual product development the inclusions, features, colours and technical specifications of Advanced Shutter Industries products may change without notice.